Markets were surprised by the news that the Climate Change Committee had been discussing the possible ban of some ERUs from the EU ETS on its last meeting on the 17th of October 2012. According to the information leaked from the meeting the European Commission considers banning ERUs issued after 2012 by countries that do not sign up to an international agreement on emission reduction targets. The decision would affect mainly emission reduction units issued by Russia as the country said several times that it doesn’t see any relevance for signing a second target until the other big polluters like China and the US do not show any willingness to do the same. This kind of decision could cause a flood of ERUs issued before the end of December 2012. The market reacted negatively on the news and both ERUs and CERs fell hand in hand to record lows day by day. The recently published Agenda of the next meeting of the Climate Change Committee to be held the 15th of November, however, doesn’t contain any decision about this topic. This means that the ban can first be negotiated and voted on the meeting in December 2012. Considering that the decision of the Committee goes to the European Parliament for a three month scrutiny, the chances of passing the amendment are low. The carbon exchange BlueNext in Paris closes its doors on the 5th of December 2012, the shareholders NYSE Euronext and France’s Caisse des Depots et Consignations announced end of October 2012. BlueNext was one of several exchanges competing to sell emission allowances on behalf of the 25 EU member states in the third trading period that starts in January 2013. The EU, however, selected the Germany-based EEX to be the temporary common auction platform (TCAP) and to sell the allowances. BlueNext handled more than 1.1 billion metric tons of European Union permits in 2009. The company has hosted spot trades totalling 29.4 million tons this year. There is no outstanding open interest in any derivatives contract. Germany kicked off the Phase 3 auctions with offering 3mn spot EUAs on the EEX on 26th of October. The auction was originally scheduled for the 12th of October, but then delayed. The official explanation for the delay was that Germany wanted to give more time for market participants to gather together all the documentation and authorization in order to be able to submit a valid bid. According to the relevant EU law potential bidders have to obtain a license from their domestic competent authority. In many countries, however, there is not even a legislation assigning this power to an authority. Despite this fact the first Phase 3 EUA auction was successful. It settled at a price of EUR 7.54 compared to the actual market price of EUR 7.65 of the EUA Dec12 contract. Fifteen bidders participated in the auction which was seven times oversubscribed. Germany will continue offering Phase 3 EUAs every Friday until end of 2012 on EEX. The country was also the first in auctioning 2.5 million spot 2012 EUAAs on the 31st of October. The auction was oversubscribed 1.8 times and settled at EUR 7.01. 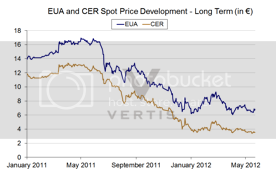 The price of the benchmark EUA Dec12 contract showed some recovery during August. There appear to be at least three factors for this: #1. Market participants hope for the European Commission to reach an agreement about the back-loading of allowances from the Phase 3 auctions that would decrease the supply in 2013-2015, #2. Statements from EU leaders suggesting that they would do anything to rescue the Eurozone, #3. Linking the emissions trading schemes of the EU and Australia. However, volumes were were lower than average due to the summer holidays. The Australian Minister for Climate Change and Energy Efficiency and the European Commissioner for Climate Action announced on 28 August that Australia and Europe would be linking their emissions trading systems. A full two-way link, by means of the mutual recognition of carbon units between the two cap and trade systems, is to commence no later than 1 July 2018. Under this arrangement, businesses will be allowed to use carbon units from the Australian emissions trading scheme or the European Union Emissions Trading System for compliance under either system. •	A price floor will not be implemented. •	A new limit will apply to the use of eligible Kyoto units. While liable entities in Australia will still be able to meet up to 50 per cent of their emission liabilities through purchasing eligible international units, only 12.5 per cent of their liabilities will be able to be met by Kyoto units. An interim link will also be established whereby Australian businesses will be able to use EU allowances to help meet liabilities under the Australian emissions trading scheme from 1 July 2015 until a full link is established. Linking the two schemes has a positive message as it could be the first step towards a global emissions market. After the publication of the announcement the price of allowances started a heavy appreciation as people hoped for Australia to absorb the oversupply of European allowances. Calculations, however, show that the possible demand from Australian companies might be 100-200mn in the period between 2015 and 2020. Other estimations show that the oversupply of the EU ETS is around 1.2-1.4bn of allowances, significantly higher than the possible additional demand from Australia. The decrease of the limit of Kyoto units admitted for compliance in Australia has a negative effect on the price of these units. Activation of the upgraded Union registry that includes additional functionalities for phase 3 of the EU ETS is scheduled to take place in the last week of September or the first week of October. It is expected that access to the registry will be suspended for a maximum of one day. Together with a number of improvements, the new software release includes functionalities enabling the auctioning of Phase 3 and aviation allowances, the new trading account type and a trusted account list. The trusted account list adds to the set of security measures available in the single registry. This measure prevents any transfer from a holding account to an account that is not trusted. After its activation, an account holder wishing to initiate a transfer to an account that is not on the trusted account list will need to open a trading account. More information on the exact timetable, including the start and end dates of the activation, will be communicated on the Commission’s website on 17 September. The European Commission (EC) has postponed by two weeks the deadline for a public consultation on delaying carbon allowance auctions. The consultation period, which was due to end on 3 October, will now continue until 16 October. Carbon market participants were already disappointed when the draft document was published on 25 July 2012, because it did not contain exact figures and timing of the auction delay. The document only sketched possible scenarios. Market might have hoped for a speedy finalised process from the EC in autumn. The delay was announced on 31 August and could not have a negative impact on carbon prices, because positive global mood outweighed the negative message of keeping carbon market in uncertainty for a longer time. Trading in the carbon market throughout July was marked by expectations, news and rumours about the Phase 3 changes to be published by the European Commission (see next page). The benchmark EUA Dec12 moved between EUR 8.41 and EUR 6.53. Traded volume of the same contract on the ICE Futures exchange increased to 341.2mn in July 2012 compared to 108.3mn in July 2011. From the regulatory side we do not expect any news which can have an effect on prices, as decision makers enjoy their summer holidays. In August macroeconomic developments might be influencing the prices. In August, the decisions makers typically enjoy their summer break only returning to work in September. We therefore do not expect any price effect from the regulatory side on the carbon market. Macroeconomic data and news about the Eurozone situation might have an influence on the price for the next couple of weeks. Meanwhile, before they went away on vacation the European Commission concluded on 25th July a review which had been initiated in mid-April concerning the time profile of EU ETS auctions. They proposed a Decision to clarify the provisions of the EU ETS Directive on the timing of auctions of emission allowances. The auction time profile concerns the distribution of auction volumes over the eight years of the EU ETS third trading period from 2013 to 2020. Macroeconomic developments in recent years give reason for amending the current time profile by postponing or ‘back-loading’ some auction volume from 2013-2015 towards the end of Phase 3. To get this work underway and provide the market with the necessary stability for such a future change of the time profile, the Commission proposed a minor amendment to the ETS Directive. The proposed Decision aims to clarify that the timing of auctions within a trading period may be changed by amending the Commission Regulation on auctioning in order to ensure the orderly functioning of the carbon market. The Decision requires approval by the European Parliament and Council. The amendment would affect only EUA auctions, not those of EUAAs. The planned modifications don’t mean any changes to overall volumes in Phase 3. The back-loading means holding back allowances from 2013-2015 and letting them back into the scheme in 2018-2020 or possibly in 2020. The stakeholder consultation is open until 3 October 2012. The amendment has to be adopted through Comitology (no timeline). It is the clarification of the power of the EC (of the Article 10 (4) of the Directive 2003/87). Nothing else can be changed in the Directive. The European Parliament and the Council will decide by co- decision (this is the ordinary legislative procedure). The amendment has to clear what “exceptional circumstances” are. The structural measures were deleted. The documents do not contain any concrete mentioning of set-aside. The document mentions three options for back-loading of allowances: 400mn, 900mn and 1,200mn and the numerical impact assessment on each withholding options. It is important to emphasise that there is a huge flexibility in quantities and timing of auctions as stakeholders have the right to suggest new options. Impact assessments show that back-loading of 900mn allowances is the most balanced view. Back-loading 1.2bn allowances was preferred by DG Clima, but not by the EC. According to polls back-loading 1.2bn allowances would have the most dramatic effect when letting the allowances back into the scheme. The table below illustrates the possible price effect of the different scenarios outlined by the EC. Later this year the Commission will present a first report on the functioning of the European carbon market. This offers an opportunity to launch a thorough debate on what structural measures might be needed to address the challenges in the EU ETS. Besides of the subsisting hopes of the modification of the auction regulation, mainly macroeconomic events influenced the carbon market. The agreement of the EU summit on 29 June about helping Spanish and Italian banks without increasing these countries’ debt had a positive effect on prices. The increasing trend lasted until the ECB, the Bank of England and the Chinese central bank decided to boost liquidity in the market signalling views on a weak global economy. This led to falling oil prices and depreciating Euro, both having a negative effect on carbon prices. This year has brought two novelties to the carbon market: the inclusion of the aviation sector into the scheme from January and the new Union Registry which started just a few days ago. Carbon had a bullish start to the year as market participants expected the Industry, Research and Energy Committee of the European Commission to vote for a measure called set-aside. Up to the vote on 28 February 2012, EUA Dec12 prices rose to EUR 9.63, the highest this year. After the vote, traders realized that this was only the beginning of a complicated legal procedure and took their profit. The benchmark EUA Dec12 contract fell below EUR 7.00. The negative trend was helped in early April by the publication of 2011 verified emissions data, which showed a fall of 2% compared to analysts’ expectations of a 1-2% increase. 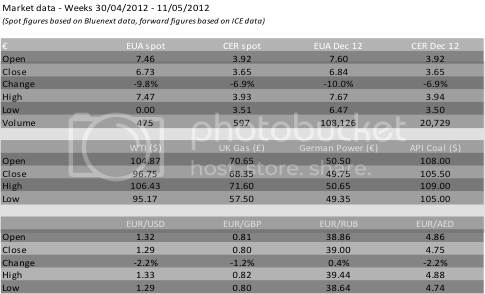 The EUA Dec12 price fell to EUR 5.99, a level never seen before. The European Commission felt that the low carbon price was not stimulating green investment. DG Climate Action presented the idea of delaying the auction of hundreds of millions of Phase 3 allowances and only selling them at the end of the Phase. The carbon price began to rise again. By the end of June, the EUA Dec12 reached EUR 8.29 from EUR 6.17 on 1 June, meaning a growth of more than 30% within a month. Yet law firms and three directorates of the European Commission expressed concern about the legality and feasibility of changing the auction regulation. The price fell immediately below EUR 8.00 again. Traded volumes on the exchange BlueNext in the first six months of the year fell on the spot market. 17.3m EUAs were traded compared to last year’s 21.9m due to the migration to the Union Registry when spot trading was stopped. The volume of futures contracts grew healthily. 1,886m EUA Dec12 changed hands compared to 556m in 1H2011. The roller-coaster ride may well continue! Changes to auction regulations might have an immediate price effect, although some say that the delayed sale of 400 million allowances is already priced in. A positive effect would be caused only by a higher amount being held back. Regulatory and economic uncertainties mean that we can expect an exciting coming 6 months in the carbon market. Expectations for the average EUA price for the second half of the year range from EUR 5.70 to EUR 9.50 with a market consensus of EUR 7.55. On 6 July, the European Commission (EC) announced that it would grant free carbon allowances to power stations in Bulgaria, the Czech Republic and Romania for the third phase of the EU ETS. These power plants will get a total of 233mn permits without charge starting in 2013. The amount of free allowances will decrease year by year. Eight countries have been granted exemption from the rule that power plants should purchase all their CO2 permits from next year on. The EC granted Cyprus, Estonia and Lithuania free allowances already in June. Poland and Hungary are still waiting for a positive decision. On 20 June 2012, the Union Registry was fully activated for all EU ETS participants. On 30 January 2012, shortly after airline operators became subject of the European Union Emissions Trading Scheme (EU ETS), the Union Registry had partially opened already, but only for aircraft operators. In order to participate in the EU ETS, airline operators have to have an account with the Union Registry. Only with an open account they are able to receive their free allocation determined by the administering Member State. Until now, stationary installations such as power plants, paper and glass manufacturers have held their accounts with national registries in each country. The full activation of the single Union Registry, including the transfer of existing accounts of installations from national registries, happened in the first half of June 2012. After two weeks of suspension from 2 June, the Union Registry became operational on 20 June. The Union Registry now also includes the accounts for stationary installations and personal accounts previously held in national registries. Users of former national registries will be able to use the Union Registry as soon as they receive their new authentication credentials from their national administrator. Some functionalities required for phase 3 of the EU ETS as from 2013 are not yet included in the Union Registry. The first software update will cover enabling phase 3 auctions, the new trading account type and a trusted account list. The scheduled timetable for the deployment of this first update will be communicated by 15 July 2012. European Commission draft proposals to try to prop up the EU’s Emissions Trading Scheme (ETS) could delay the sale of 400 million to 1.2 billion carbon allowances, according to EU sources. The delay would cover the first three years of the next phase of the carbon market, 2013-2015, and then the allowances would be released over the following three years, 2016-2018. The total amount of the backload would be either 1.2 billion, 900 million or 400 million allowances. A German law firm said, however, that the intervention of the European Commission is not in line with the European legal system which allows any intervention only in the case, when carbon prices are too high and mean a disproportionate burden for businesses. According to latest news there are three departments of the bloc’s regulatory arm (the directorate for industry, transport and economic and financial affairs) which also object the draft of amending the auction regulation. They say that it is a negative message for markets if the scheme is not predictable and voiced concerns about the lack of a full impact assessment. Last, but not least they also question the legality of the planned steps. The draft of the amendment of the auction regulation was expected by mid-July when an assessment report about the EU ETS will be published with suggestions on how the scheme could be improved. From 30th May to 1st June 2012 Carbon Expo, the world’s leading international trade fair and conference for carbon trading, emissions abatement and clean technologies took place in Cologne, Germany. Our carbon partners at Vertis Environmental Finance were one of the exhibitors with their Chairman James Atkins moderating a session about EU ETS. -	the Climate Change Conference in Durban last year was assessed by many as forward-looking, but participants agreed that there is still a lot to do until the next meeting in Doha, Qatar in November this year. -	participants were divided about the chances of a global agreement on a second commitment period of the Kyoto Protocol, because of a disappointing 2-weeks of negotiations in Bonn, Germany prior to the Carbon Expo did not bring any achievements. 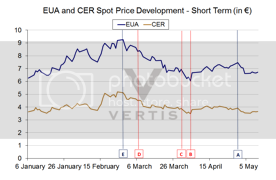 -	for installations within the EU ETS the EUA price is important only on the short run. From the long-run perspective reliability and stability of the scheme are more important, because utilities make their (investment) decisions considering the 5-10 years forward. -	representatives from the aviation sector seemed optimistic about International Civil Aviation Organization (ICAO) to come up with a globally acceptable solution about the regulation of the sector’s emissions. All in all, the market expects a labour-intensive six months ahead. Important decisions (about second commitment period, auction regulation, set-aside, aviation etc.) are expected to be made that will have an effect on the trading practice of market participants. The European Investment Bank (EIB) held 8th June 2012 the first auction of EUA Dec13 contracts from the NER300 on the German EEX. A total number of 625,000 EUAs for delivery in 2013 were offered, but investors bid for 2.25 million which means that the auction was oversubscribed 3.6 times. The result can be assessed as positive, given the fact that German market participants did not take part in the auction due to a national holiday. The auction was cleared at EUR 6.83, just 2 cents below the market price which did not have any effect on the market. The EIB will hold 32 auctions, selling 625,000 EUA Dec13 four times a week until the end of July. Some analysts say that pouring more allowances into the oversupplied market contradicts the aim of the European Commission of giving a support to prices. The next meeting of the Trialogue (representatives of the European Parliament, the European Commission and the Danish presidency) is scheduled for 13th June 2012.
a. If the cut of member states’ energy consumption by 20 percent by 2020 should be a binding goal or not. b. The amendment of the Energy Efficiency Directive (EED) which would allow members states to withhold allowances to curb oversupply (set-aside). Member states are opposed to including the so called set-aside into the EED. They argue that the carbon market is regulated by a different law. The European Commission approved requests from Cyprus, Estonia and Lithuania for a continued free allocation of EUAs to their power sector beyond 2012. In total, close to 35mn EUAs were granted for the 2013-2019 period. The general rule is that from 2013 on the power sector does not get any free EUAs and has therefore to purchase all its allowances needed at auctions or in the market. The revised EU ETS Directive adopted in 2009, however, makes it possible for ten Member States (Cyprus, Estonia, Lithuania, Hungary, Poland, Romania, Bulgaria, Czech Republic, Malta, Latvia) to request temporary exemption from this rule. The derogation makes possible to allocate no more than 70% of emissions for domestic electricity supply in 2013, declining annually thereafter. The derogation must finish in 2019. Malta and Latvia did not use this opportunity. The other eight member states submitted until 30 September 2011 their national plans with details of the installations and the number of allowances affected. The national plans contain also investment plans the value of the free allowances will be channelled into (for example upgrading the country’s energy infrastructure, including new power plants, diversification of the energy mix and sources of supply, clean technologies). The applicants have to report the European Commission about completion of these projects. The assessment of the application of the other five Member States (Poland, Czech Republic, Romania, Hungary, and Bulgaria) is continuing and will be concluded before the summer break, the European Commission promised. A recent decision of the European Commission cleared the way for Member States to compensate energy intensive sectors (like aluminium, copper, fertilizers, steel and chemicals). In the third phase of the EU ETS power companies will not get any free allowances and have to purchase all of them covering their emissions. Consequently, the energy bills of energy intensive companies will increase, their competitiveness deteriorates. The European Commission decided to allow Member States to use the money from selling EUAs to pay up to 85 percent of the additional energy costs of these companies. The step was not welcome by all Member States. Germany indicated it would be ready to compensate the big energy users. Other states however fear that production could shift from cash-strapped states to richer countries. UNFCCC members held a Climate Change Conference in Bonn between 14 and 25 May 2012. Among the meetings the first session of the Ad Hoc Working Group on the Durban Platform for Enhanced Action (ADP) also took place. The meeting had the aim of agreeing on a work plan for the ADP, but some countries were wrangling about procedural details which could derail the entire process, participants said. The EU would be willing to reduce greenhouse gas emissions, if other developed countries take similar steps and if developing countries undertake appropriate measures. The European Commission published the planned transition timetable for the full activation of the EU Emissions Trading System single registry which is scheduled to take place in June. •	Starting on 14 May at 10:00 CEST, account holders will not be able to open or close accounts or to modify account and account representative details, neither in national registries nor in the single registry. •	From 3 June at 10:00 CEST, the operation of national registries and the single registry will be suspended and account holders will not be able to access registry accounts - including allowances held in these accounts. •	On 20 June at 12:00 CEST, the single registry will be fully activated. Users of existing national registries will be able to use the single registry as soon as they receive their new authentication credentials from their national administrator. Account holders will have to comply with increased documentation requirements and security features to access the transferred accounts in the single registry. Account holders will not be able to transfer any allowances until all necessary documentation requirements are completed. The single registry to be activated in June will not contain all the required functionalities for Phase 3. In particular, a first update following the activation of the single registry will cover functions enabling phase 3 auctions, new account categories and a trusted account list. Software development for this first update has already commenced and the scheduled timetable will be communicated by 15 July. The UK government sold 4 million spot EU carbon permits for a record low 6.67 euros each in its historically most undersubscribed auction. The UK Debt Management Office said the sale attracted bids worth 14.25 million units, representing an oversubscription rate of 3.56, a record low. Installations covered by the EU Emissions Trading Scheme surrendered 254.6 million U.N.-backed offsets for the compliance year 2011, which is almost the double of the amount handed in last time. The figures included 178.8 million Certified Emissions Reductions (CERs) and 75.8 million Emissions Reduction Units (ERUs). The European Commission is expected to discuss the modification of the auction regulations in September 2012, a UK government official said. This is later than the date of mid-July which was mentioned in the media earlier. After the compliance period ended on 30 April 2012, the benchmark EUA Dec12 fell sharply until EUR 6.50, and stopped at this level rather than plummeting further on generally negative economic sentiment in the Eurozone. In the past week the front-year contract was trading in a tight range between EUR 6.47 and EUR 6.95. CERs were more resistant to downward pressure and depreciated 6.9% in the last two weeks. Volumes were very low in all instruments of the carbon market, which is not expected to improve in the coming weeks as investor confidence remains low due to the Eurozone crisis. The European Union plans to review the regulation on Phase 3 auctions as one of the possible tools in the combat against the oversupply of the ETS, EU Climate Commissioner Connie Hedegaard said after an informal meeting of the European environmental ministers mid-April. The European Commission also plans to bring forward an annual report on the ETS which could be a good opportunity to review the auctioning regulation. Both are scheduled by the end of this year. More than 12,000 European installations are subject of the ETS which became oversupplied as caps were defined before the global financial crisis started and which made emissions plummet in a way that according to analyst estimates the system could be oversupplied by some 1.1-1.2bn allowances by the end of 2012. The suggested revision of the auctioning regulation might have as a consequence only the rescheduling of the auction timing while the amount of allowances would not change, climate spokesman of the European Commission Isaac Valero-Ladron said. Despite this the revision of the auctioning regulation might be the first step to limit at least temporarily the supply of allowances while the EU will continue to explore long term structural issues to resolve the problem of oversupply. Amendments to the Energy Efficiency Directive (EED) aiming a so called set aside of allowances is still on the agenda, but its execution might take more time than the modification of the Auctioning Regulation. Poland, the biggest opponent of the set-aside, is going to propose for the EU to allow big emitters in the EU ETS to use AAUs for compliance. In the Phase 2 of the EU ETS, Central European countries have accumulated a surplus of about 2.4 billion AAUs, and there is no decision on how the units can be used after 2012. The adoption of the proposal would no doubt depress EUA prices. According to the Polish paper, including AAUs in the EU ETS would help the EU’s cap-and-trade system to gather ground in other countries and to make bilateral offset mechanisms. This Polish proposal, however, seems unlikely to be accepted at a time when EUA prices are hitting all-time lows. Early next year the European Commission might reduce the number of installations eligible for free allowances in Phase 3, if carbon prices remain at low levels. The Commission set the number in 2009, but might amend it as low prices do not hinder competitiveness anymore. Swapping green CERs to grey ones If you own “green CER” units (CERs that can be used in Phase 3 of the EU ETS), we would recommend that you swap them to “grey CERs”, as they are cheaper and you could make a small margin or hold them until next year, when most analysts are expecting a widening spread. The benchmark EUA Dec 12 appreciated 6.5% between 16 and 27 April, but daily volumes lagged behind the 30-days moving average. 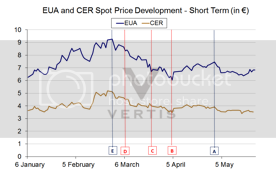 Supported by compliance buyers the spot EUA gained 8% during the same period. Certified Emission Reduction (CER) units underperformed global markets. 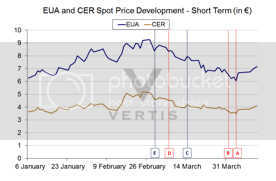 The spot CER closed at EUR 3.80 on 27 April, 30 euro cents lower than two weeks ago. 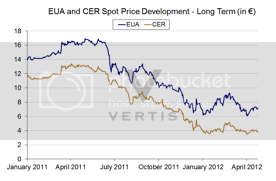 Consequently, the spread between spot EUA and CER prices increased 61 euro cents to EUR 3.52 during the last two weeks. In the first week of April 2012 EUA prices declined until hitting a new historical low at EUR 5.9. After this, however, prices started to increase and closed 13 April at EUR 7.15 which means a 3.2% increase compares to the closing price of 30 March. CERs proved more resilient did not hit a new historical low. 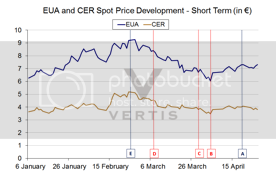 Spot CER closed at EUR 4.10 last Friday, an increase of 5.4% compared to the last day of March. 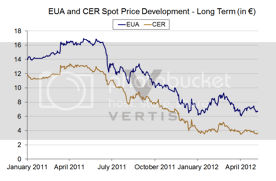 The benchmark EUA Dec 12 contract finished at EUR 7.20, 8 eurocents or 1.1% higher than 30 March 2012. “Publication of the benchmark values enables airlines to calculate their free allocation of allowances up to 2020. One benchmark has been calculated for the trading period in 2012 and another for the trading period starting in January 2013. In 2013 to 2020 an airline will receive 0.6422 allowances per 1,000 tonne-kilometres, while in 2012 it will receive 0.6797 allowances. The benchmark for each period was calculated by dividing the total annual amount of free allowances applicable to the 2012 and 2013-2020 trading periods by the sum of tonne-kilometre data included in applications by aircraft operators submitted to the Commission. The submissions by aircraft operators are based on independently verified tonne-kilometre activity data recorded throughout the 2010 calendar year. The example aircraft operator flew a verified 100 million TKs on EU sectors during the 2010 benchmark year will subsequently receive 67,970 free allowances to be submitted against whatever volume of their emissions will be for the year of 2012. Let’s assume that this airline will emit 100,000 tonnes of CO2 in 2012. Following the airline’s submission of its 2012 verified emissions report in March 2013, in addition to submitting these 67,970 free allowances it will need to have purchased (at any time between now and March / April 2013) the additional 32,030 carbon permits (EUAs, CERS or EUAAs). This airline will also receive 64,220 free allowances against each operating year from 2013 to 2020, based on its 2010 TKs, and will need to purchase the remaining carbon permits to cover its subsequent emissions growth (purchasable at any time between now and the respective submission dates). According to its emissions forecasts for 2012 and subsequent years the airline will be able to purchase carbon permits at special EUAA auctions for airlines, or EUA actions open to all sectors, or even already today via a carbon broker such as Climate Corporation and their “Carbon Pool Europe”, or directly on the various carbon exchanges such as Bluenext, or futures markets such as European Climate Exchange. They might do so if they were to forecast that today’s carbon prices are a good buying opportunity and wish to lock-in the potential price advantage, for example. In the event that an airline were to reduce its frequency of flights to Europe, or reduced emissions through introducing a significant level of bio or other alternative fuels, and their level of CO2 emissions became lower than the number of 64,220 free allowances per annum from 2013, then the airline could either bank them for their future use in case of expected future growth, or alternatively sell them to a broker or another company in the ETS and keep the profits. Conversely, a fast growing airline can apply to be considered to receive additional free allowances under the 3% special reserve set aside for this purpose, but as of today there is no clarity on who can qualify, what the application process is, and how the number of additional allowances would be calculated for a successful applicant. Should you need any further explanations or help in estimating your allowances or understanding various carbon strategies, or carbon purchasing options, please do not hesitate to contact our ETS experts using the contact form on this web site. Disclaimer: The opinions, data and the articles on this site should not be considered investment advice nor indication or guarantee of suitability or potential value of any particular carbon permit or strategy, or information contained herein. We strive to be as accurate as possible but we accept no liability for errors. The EU Commission has released a tool primarily for small emitters to allow them to estimate CO2 emissions, as part of their compliance with the EU Emissions Trading System. The tool enables aircraft operators that qualify as “small emitters” with few flights or emissions to use simplified monitoring procedures. However, the tool can also be used by other larger aircraft operators to also estimate emissions for specific flights where actual data is exceptionally not available and hence could become an important tool for them.